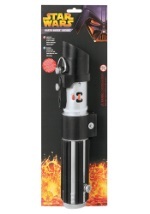 You'll be ready to become Master of the Order with the help of this Mace Windu lightsaber. This Star Wars light saber accessory features a purple plastic “blade," which can be pulled out from inside the handle and measures at almost 3 feet long. Push the power button and the blade lights up (requires two AA batteries which are not included). You'll be fit for the Battle of Geonosis with the addition of this Mace Windu lightsaber.